Klak klak klak klak, the jarring sound of the jack hammer filled the chamber as the miner bore down on seemingly impenetrable hard rock. The racket was deafening. The air warm and thick with humidity. Marwin glanced up to note my arrival at this point, some 300 meters down the famous Scorpion mine shaft No. 4. Without a word, nodding his head, he extended his hand to pass me a piece of dark grey rock recently chipped from the shaft walls. I wiped the mist from my glasses, and shining my penlight on its contents, the rock revealed a sparkle of green light along a thin seam. Tsavorite, the fabulous green garnet; the gemstone and its history that drove me to journey to Africa in the summer of 2016. 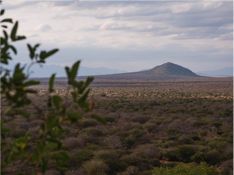 The idea of journeying to Kenya came to me while attending the AGTA Gemstone Industry & Laboratory Conference meeting at the 2016 Tucson Gem Show. Bruce Bridges of Bridges Tsavorite was invited to speak to the group about his company and its involvement with tsavorite. Bruce spoke of its discovery in the 1960’s by his father, the late, renowned geologist Campbell Bridges, as well as the progression of their mining business in Kenya through to the present time. After the meeting, I introduced myself to Bruce at his AGTA booth and gingerly commented that I would love the opportunity to visit his Scorpion Mine in Kenya during our summer holiday. To my delight he agreed to host a mine visit for both my wife Carol and me in July. The planning was set in motion. 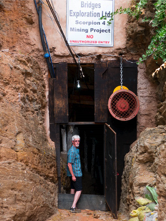 Bruce’s only caveat was that I should be aware of some risk to our well-being in visiting the mine. There was a concern with security. The concern would weigh on me as my planning went forward and I learned more of the mine’s history, wondering if I wasn’t making poor judgement in planning such a trip. Our travel arrangements went well and by May, with the continued help of Bruce by email in coordinating our trip, we were settled to visit the Scorpion mine mid July. 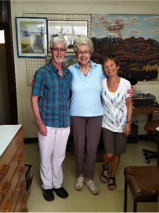 Upon arrival in Nairobi we would visit the office of Bridges Exploration to meet with Bruce’s mother, Judith Bridges and have the opportunity to view the sorting and cutting rooms. As well, I planned on purchasing some rough material for faceting. Our flights and hotel arrangements were booked, including two safaris in the nearby national parks of Amboseli and Tsavo. Thus, in late May, when I received an email from Bruce that their mining operation had been shut down temporarily due to the continuing conflict with local government officials, my worries were compounded. Would we still be able to visit the mines? How would this affect the security of our visit? To my relief, Bruce assured me that our visit could still proceed, only that we would not see the mine in working operation. Communication in rural Kenya is not always reliable and preparing for the inevitable “Where are we?” I packed our TomTom, as well as my old I-phone that I fitted with a local sim card . Opting not to take the advice of Bruce and others to hire a driver/guide, we departed on our own from the airport in our rental Renault Duster SUV. The adjustment to driving a standard shift on the left-hand side was just the beginning of our road trip trials. On the Mombasa highway; the major route between Nairobi and Mombasa, we endured a twolane nightmare choked with semi-trucks transporting goods to and fro, along with broken down vehicles that hugged the side of the road. Major delays were common due to road improvement projects. Slowing to pass through small towns along the way we gained an insight into the lives of the local people. As I had suspected, GPS units are not always reliable in Africa and the TomTom often repeatedly told us to “Turn right at 300 meters” when all we could see were perfect rows of farmed sisal extending for miles, with no road insight. Before leaving Nairobi for the mine we made arrangements to meet one of the mining partners, Marwin Sinapius in Mwatate; a small village located one hour drive from the site. After taking a wrong turn and ending up unexpectedly at the Tanzanian border, we rerouted along a treacherous, rocky road for three hours only to arrive at Mwatate in the late afternoon. It turned out well as Marwin had been delayed in Voi. A recent partner of the Scorpion mining operation, Marwin is of German nationality, schooled in Germany and Britain, with a business major. He was currently serving as onsite manager of mining operations and maintenance. Being tall and fair, we had no problem spotting him as he pulled up in Mwatate in his trusty, well used Land Rover. After our brief greeting we climbed back into our Renaud and raced after him along dusty, curvy roads that led us finally to the Scorpion mine. was known to sleep on one of the beds while the family was away. Upon their return, the leopard would display its annoyance by snarling throughout the night. 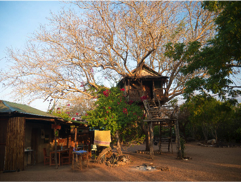 This tree house still stands today and was a welcome sight upon our initial arrival to the camp. ht just outside the camp perimeter. When evening fell, the bush babies, known as Nagapies (meaning “little night monkeys” in Afrikaans) were a delight to see. Jumping from tree to tree, their big eyes acted like mirrors in the beams of our flashlights. After a restful first night under the mosquito net in our mud and rock abode, we arose early to explore the area on foot. Over breakfast, Marwin familiarized us with the mine layout, and leaving him to his work Carol and I trekked off into the nearby surrounding bush. There we found many remnants of early mining exploratory trenches along with the occasional pile of elephant dung! The rather fresh and large animal tracks that we found resulted in us making a hasty retreat to the security of the camp. After lunch we had the opportunity to visit Scorpion mine shaft No 4. Marwin had entered earlier in the morning to supervise some exploratory work, so it was with some trepidation that we donned our helmets and descended solo down the trench and through the security door. At close to a 45 degree incline, Carol and I carefully made our way down the shaft in the direction of the m achine gun sound emanating from the jack hammering below. The shaft is well supported by an extensive array of wooden beams as well as Split Set rock stabilizer friction bolts. Bridges is very safety conscious and it is the only coloured stone mining company in Kenya to install these friction bolts. Many hoses extend down the shaft supplying fresh air and power. 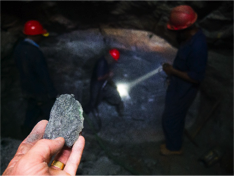 As well, a misting system has been installed to eliminate any dust in the air, thus reducing the possibility of silicosis developing in those working in the mine. As we descended, the air became moist and warm and my camera lenses and glasses soon began to fog up. As the tunnel narrowed, Carol bid me farewell. This was far enough for her nerves to venture. A short distance later, I finally arrived to see Marwin and the workers hard at work drilling into the tunnel wall. Had the mine been fully operational, the workers would have undoubtedly been drilling holes to set dynamite charges. Although I did not see the ”Mother Load” being plucked from the walls that day, Bruce was right….our journey to the Bridges Scorpion Mine turned out to be a fantastic adventure! Our trip to Kenya and the Scorpion mine was an unforgettable learning experience for me. Overcoming my initial anxiety about visiting the mine and actually carrying out our journey, gave me great satisfaction. To view firsthand from where gem stones originate and to see firsthand the labour needed to extract them and bring them to market, only deepens my appreciation for their unique value. 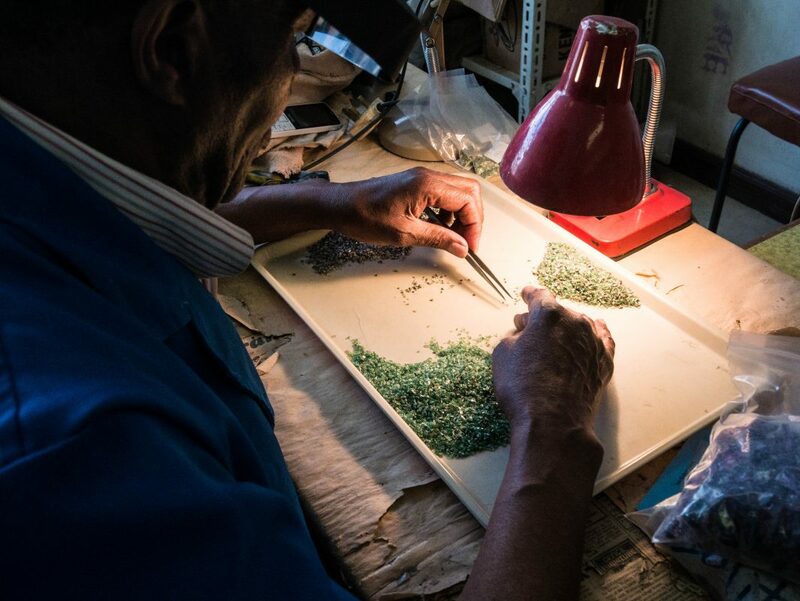 Departing from the Nairobi airport, we knew that we would miss Kenya, but looked forward to the next leg of our trip, a visit to Idar Oberstein, Germany, to witness the master lapidaries bring to life the true beauty of these wonderful gemstones. This entry was posted in Uncategorized and tagged harold lindsay, Imperial gem Lab, jewelry appraisal, Kenya, Scorpion Tsavorite Mine.